I saw this article last night from the W@W website and I tell you I was like..is this for real? and yes it was. "With “I do’s” already exchanged, the newly-married couple treated their guests to the brand of fast food that they both love. 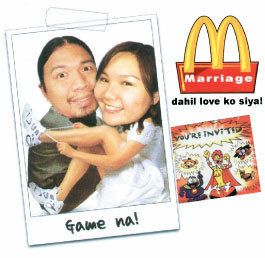 Yes, the wedding reception – or “recess,” as the couple likes to call it – took place at a McDonald’s branch along Alabang-Zapote road." and you can watch the onsite Video HERE. hala! are these couple trying to make a record? hahaha! mura lang kaya ginastos nila dito? sana sa jolibee na lang din ako nag pakasal malapit pa. hehehehe.